This entry was posted on Sunday, November 18th, 2012 at 8:36 pm	and tagged with Garlic, Herbs on Saturday, Lemon, Mushrooms, Parmesan, Parsley, Pizza, Ricotta, Simple and in Season, Thyme, Truffle Oil, Wild Mushrooms and posted in Family Dinners, Grown Up Dinners, Mains, Pizza, Vegetarian. You can follow any responses to this entry through the RSS 2.0 feed. Wow, looks yummy Louisa! I LOVE LOVE LOVE mushrooms on my pizzas! So do I Anne, particularly when they’ve a little flavour to them! Your pizza is just how I like mine, beautifully thin. 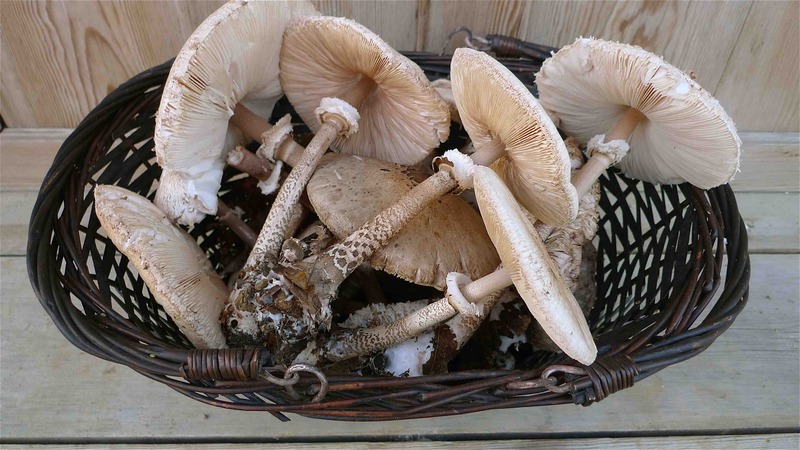 Must try a white pizza, although I have no hope of collecting such wonderful mushrooms sadly. Have pizza oven envy too! I’m never too keen on thick crusted pizzas, I prefer a pizza to be all about the topping. Tomato-less pizzas make a nice change from the norm. Looks delicious Louisa. Very keen to build pizza oven in our garden. How fantastic having an original one in your house! Go for it! I’d really like an outdoor one too, for the Summer. Along with an outdoor kitchen. Though with a whole house still to renovate then a cottage to re-construct….it’s sadly not in the 5 year plan, maybe not even the 10!. Thanks Urvashi, we’re very lucky to have a veritable feast on our doorstep!. 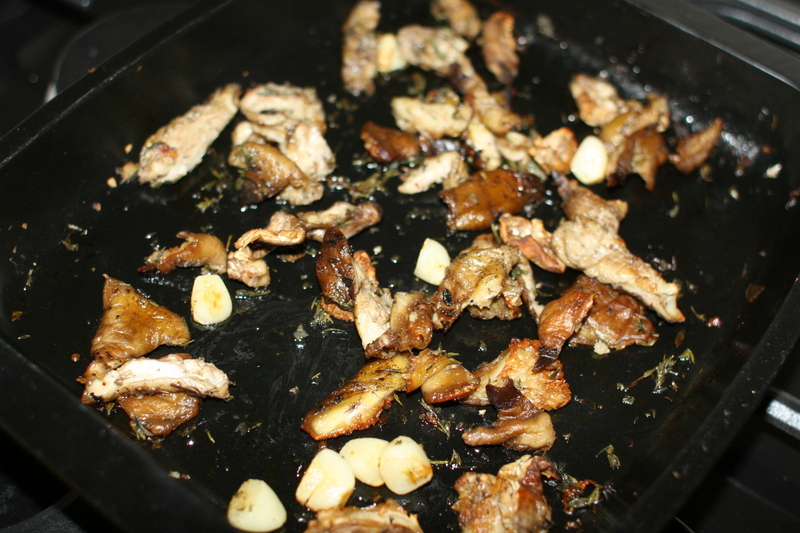 Roasting the mushrooms seems to skyrocket their glorious flavour, and stops them from being the remotest bit mushy. Amazing in a risotto like this too (a Jamie Oliver tip actually!). This sounds so good – I love mushrooms but we don’t often have them – daughter doesn’t like them… Next time she’s out at a friend’s for tea, your pizza is on the menu! My two are none too keen on mushrooms either, unless they’re chopped so small they can’t identify…which kind of defeats the point!. I tend to make them their own pizza with whatever they fancy and do our own more grown up ones with all the things they’ll complain at. That looks like seriously good pizza! I am so jealous of your pizza oven…that sounds like a lot of fun to have. 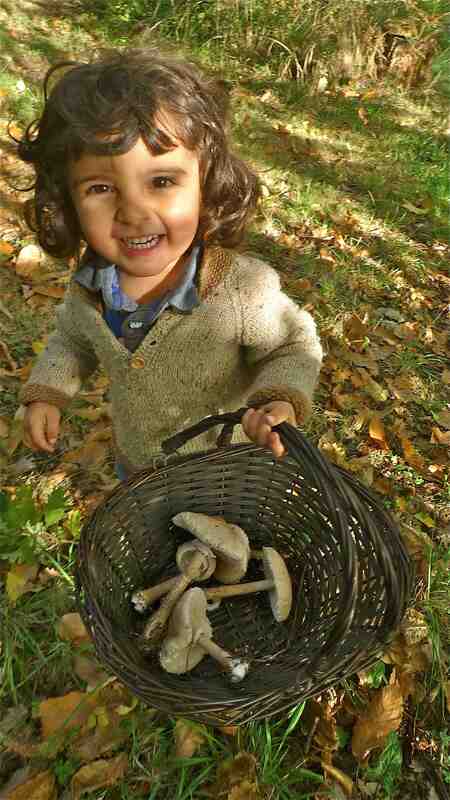 My garden is severely lacking in wild mushrooms …:( Lucky lucky you! Most of our garden is woodland so we’re pretty lucky on the mushroom front. Bet you have some mushrooms nearby though?. Everywhere I look at the minute seems to be carpeted in them, mainly inedible now though I think?!. I don’t suppose you know of any local general foraging or mushroom courses do you? My father in law has a small wood so sometimes he gives us some mushrooms….often huge ones, puffballs I think they are called. You can literally slice them up like bread! I haven’t seen any puffballs here, but they grow near my mum and dads house in Herefordshire. They’re amazing. Thanks for offering to ask around. I’ve not heard of anything our way. I’d make lots of pizza if we had a pizza oven too! Master J is quite an advanced reader for his age. Can he come tutor the ponytails? Ha ha, he is rather clever isn’t he! 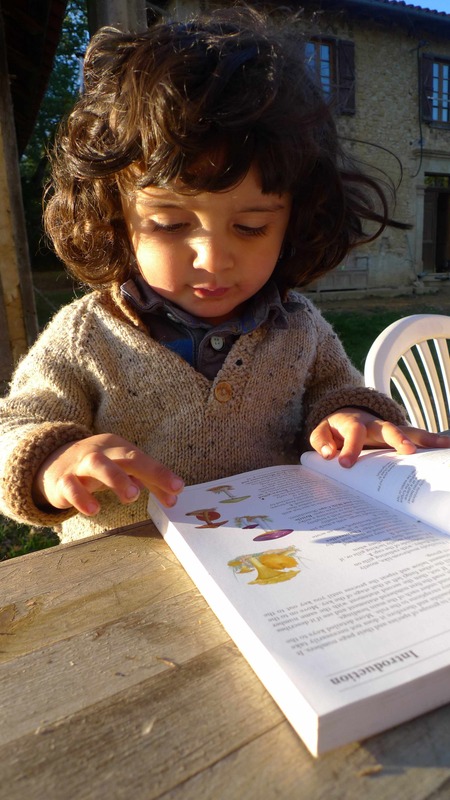 He really loves my mushroom book, screaming incessantly at every page, ‘Look Mummy, more more Mushrooms!’. 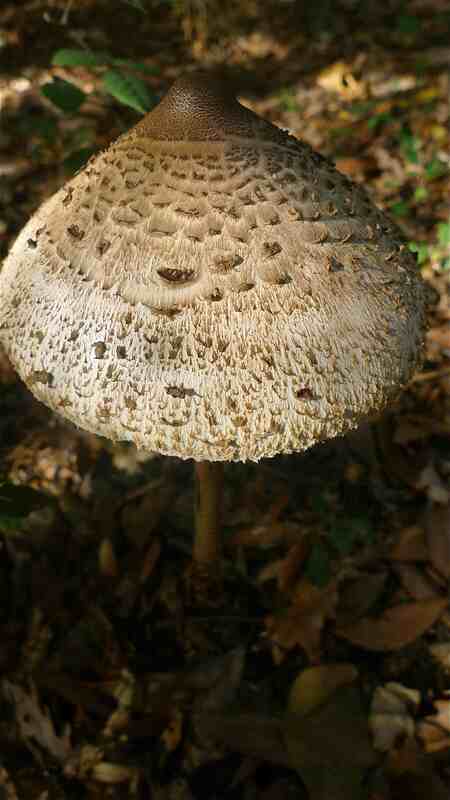 I had no idea Parasol mushrooms were so big. What an idyllic life to be able to forage the ingredients so close to home. I love mushrooms sadly my boyfriend doesn’t so I don’t have them very often, might have to make a version of this for myself one night though. Thanks for entering Herbs on Saturday. Thanks Jen, oh make it for yourself! Love a mushroom pizza! 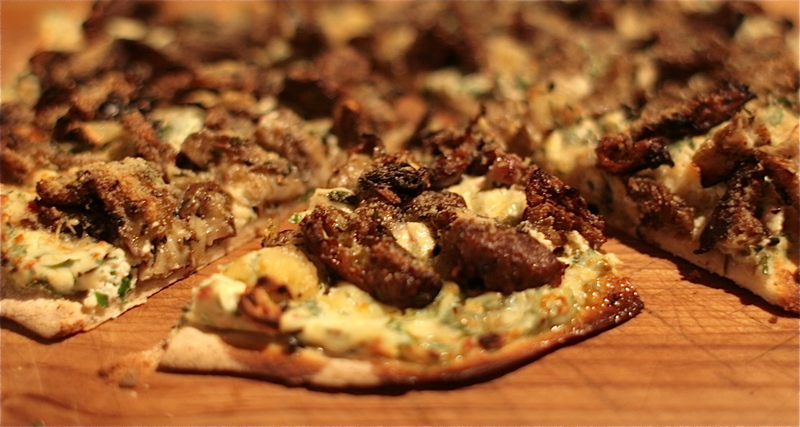 Your pizza look mouth wateringly delicious, love wild mushrooms! Thanks Camilla. Wild mushrooms certainly knock the socks off the boring wee buttons any day!